In the future, the tooth fairy will bring a Smartphone! A few nights ago, I went out for dinner and saw a little girl playing on a smart phone. I assumed the phone was her parents but what happened to the kids menu with crayons? Today, children have so many opportunities to get their hands on new technology. 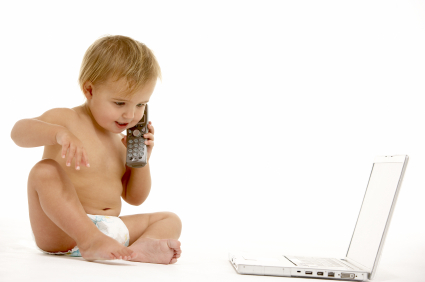 Toy stores are selling computers and cell phones for toddlers. Schools are trying to integrate various technologies into their curriculum. This makes me question, what effects will these new technologies have on the next generation? I found this article by AVG that examined the roll technology has on children. I am not convinced the results are completely accurate. According to this study, 43% of kids ages 2-3 can ride a bike. I can’t remember what age I got a bike but I guarantee I still had training wheels at age 3. Also, only 9% of children can tie their shoe laces. This is because of the Velcro shoes that light up with every step! Regardless, even if a child doesn’t know how to tie a shoe lace, isn’t there an app for that? The study goes on to say that more children know how to open a web browser then swim unaided. I know several children that are afraid of water. Even if they grow up and want to learn how to swim, can’t Google or YouTube help them? My point, technology is changing the next generation. Learning these new technologies will be more important than tying shoes laces, riding a bike or swimming. If children are having trouble getting dressed, then I might be more concerned.